I’m halfway through reading a book called “Moringa: Nature’s Medicine Cabinet” by Sanford Holst and so far it is seeming like Moringa is our answer to almost all diet deficiencies. According to Holst it strengthens bones, enriches anemic blood and enables a malnourished mama to nurse her starving baby. 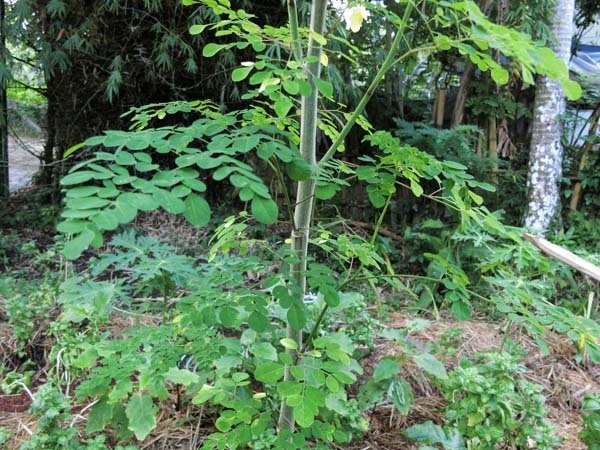 For decades northern indians and africans have used Moringa Oleifera to cure diabetes, intestinal worms, inflammations fever, epilepsy, listeria, to skin infections, toothaches, snakebites and a whole list of varying diseases. It has also been used to purify river water for drinking. 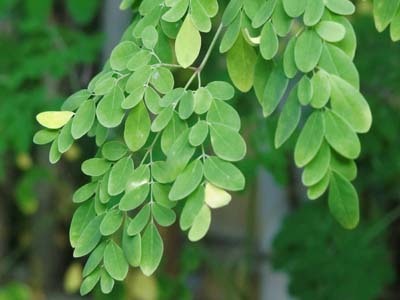 Moringa leaves contain around 40% protein, with all of the 9 essential amino acids present in various amounts. It is considered to have the highest protein ratio of any plant so far studied on earth. The protein quality and quantity is said to be similar to soy beans, but there are no reports of Moringa triggering allergies as soya does. Moringa’s leaves, pods and flowers have seven times the Vitamin C found in oranges, four times the Vitamin A of carrots, three times the iron of spinach, four times as much calcium as milk and three times the potassium of bananas…. 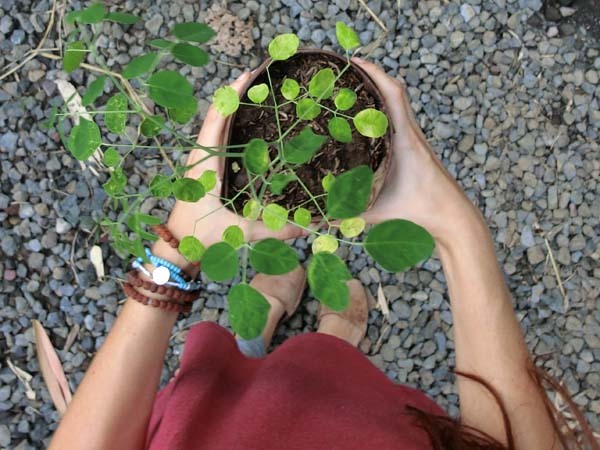 all I have to say is… Lets grow some Moringa!!! 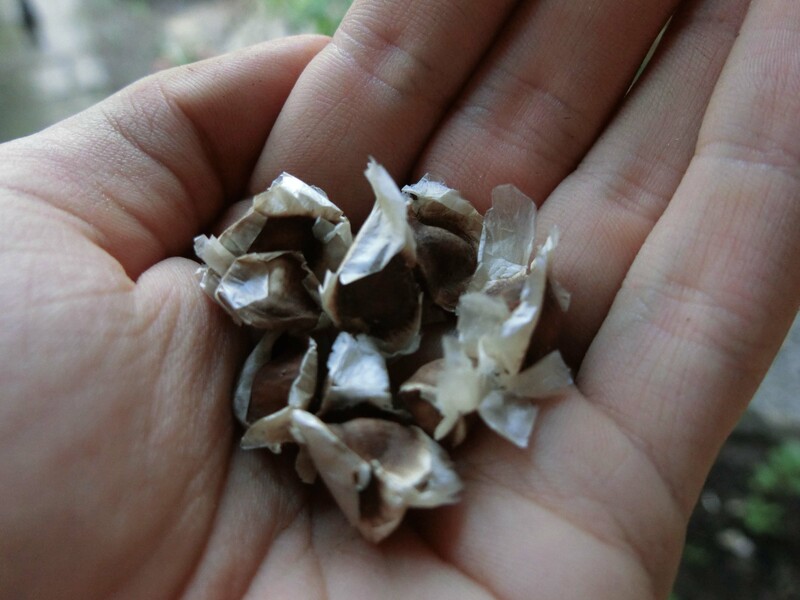 We got our Moringa seeds from a mature tree on the farm but they should be pretty easy to find in tropical countries. Seeds should be planted an inch deep in aerated soil. Germination rate is said to be quite high, around 80%, however if you keep the seeds stored for a while your chances of germination will go down by 30%, giving your seeds only a 50% chance of sprouting into life. In other words once you get your hands on some seeds plant them immediately. Basic requirements for growing are light, water and soil. Ideal soil is a sandy loam, and you can make a little perfect mixture by adding sawdust, rice straw, peat moss and compost. What’s also really great about this tree is that you can grow it indoors in a big pot just as long as it’s exposed to light. The Balinese make a yummy aromatic curry dish called Roroban. Its leaves are boiled with bumbu Bali (the base to any balinese dish – an awesome sauce made from turmeric, ginger, peppers, garlic, shallots, lemongrass, cumin, salt and pepper) and coconut milk. Great for a boost in energy! Harvest the leaves, dehydrate them, grind them and turn them into leaf powder. You can use this as a sprinkle for your food or add a teaspoon to your morning juice or smoothie. This is apparently great for treating colds. Take some flowers from your Moringa tree, bring some water to a boil and add between 5 to 7 flowers. Let water and flowers steep for 5 minutes, add some honey to sweeten and enjoy! Orin and I have been adding Moringa to our morning smoothies almost daily and we can definitely feel a slight increase in alertness. Consuming 1 – 2 teaspoons a day is enough, if you take too much it can make you quite nauseus.. this is powerful stuff! 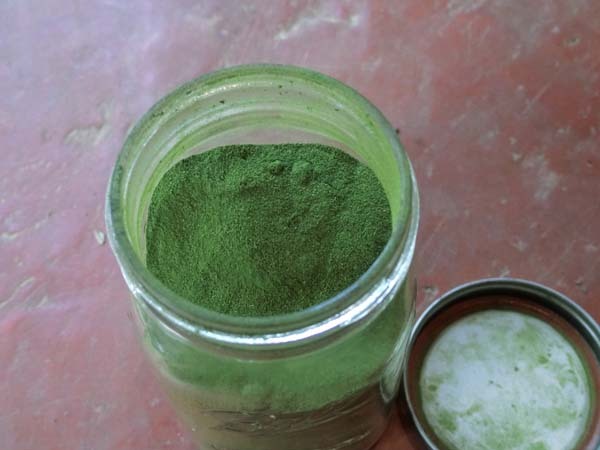 If you’ve been consuming Moringa for a while let us know how you feel… changes in energy? health? We’d love to know more about the effect its had on people. 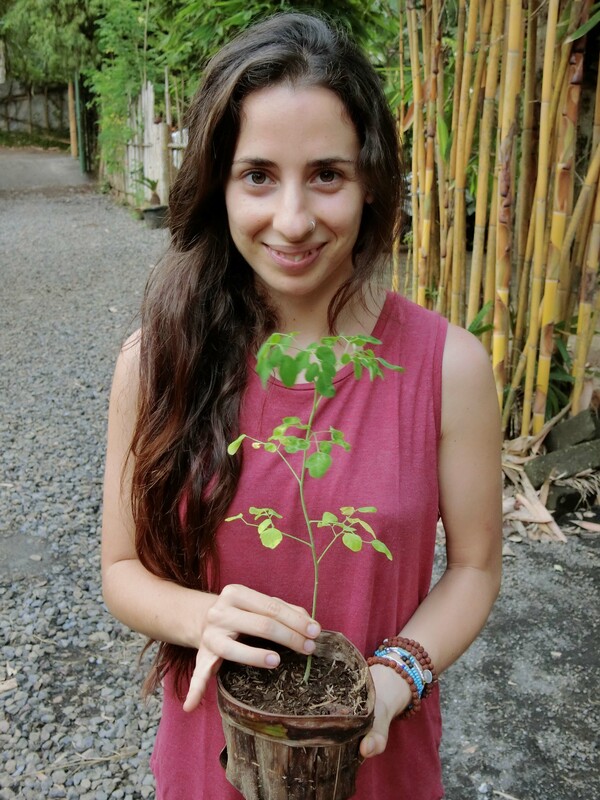 If you’re in Bali and keen to grow some Moringa yourself, we’ll soon be selling seeds, seedlings and eventually leaf powder too. Keep an eye on our online store or email kul@kulkulfarm.com to get your hands on some of this magical goodness! Hello, I am fortunate to be ralteed to one of the teachers at Green School. A bit more than 1 1/2 years ago, I was blessed to visit Bali, and the Green School Campus. Overwhelming, stunning, lifechanging and powerful. These feelings are still as strong, even though I am not there today. The students are composed of approximately 20% Balinese local students who attend on scholarship from Green School. As you pictured, the bamboo poles that comprise the structure can be carved with whatever you choose. I was pleased to know that the donation was very affordable. It was my pleasure to donate $100 to have a pole of my own . My cousin, who’s son teaches middle level students, have our poles carved right next to each other .very meaningful as we have known each other since childhood. This small price, to carve each donor pole, not ony leaves a lasting memory, but helps a Balinese child go to Green School. All of the children that attend Green School will make a difference in our world, look at the planet differently, with respect. Thank you for your article. It fills me with peaceful, joyous memories .Kathleen. Wow, this is really interesting I would love to get my hands on some of this. They say that the superstitions of a child coaintn the wisdom of the universe, the magical insight that all things are possible when approached with the innocence of belief. Journey well into the New Year. Hope to see you in the studio or along the Charles. I simply want to mention I am just new to blogs and actually savored you’re page. Very likely I’m likely to bookmark your site . You surely come with awesome article content. Thank you for revealing your website.